The Ion-Air blower operates on a low pressure principle and does not require costly compressed air. The power supply, which is required to feed the ionzing bar with high voltage, also operates on a low energy consumption level. This makes the Ion-Air blower a very efficient ionizing system, especially for applications where constant ionization is required. 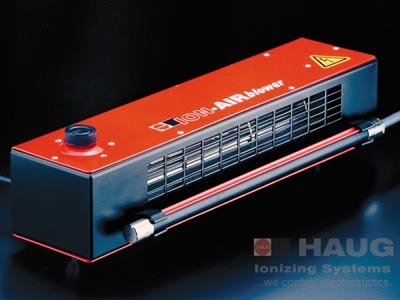 The Ion-Air blower becomes very flexible when a larger operating length is required. Several units can be “daisy-chained” in series. In this case, only one ionizing bar and one power pack is required (other lengths are also available on request).